Why book Hanoi tour package? Hanoi tour has all highlights of a thousand year old capital. Especially, the King attraction of Asia travel is amazing Halong Bay. 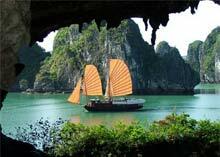 Halong bay tour is designed to mark the greatest moments in your lifetime luxury travel. The package is short but best for all Vietnam tour packages. Trip name: Highlights of Hanoi. Length of the trip: 4 days/3nights. Trip starts in: Hanoi City. Trip ends in: Hanoi City. Required booking time: 20 days in advance for group. Upon arrival, our guide will welcome you at the airport. Then, transfer to your hotel for overnight. 8:30 Start your Hanoi tour package with Ho Chi Minh Mausoleum(close on Monday and Friday), his Stilt House in a very beautiful garden, the One Pillar Pagoda. Then, Tran Quoc pagoda, the most attracted one in the middle of beautiful West lake and the Temple of Literature. 8:30 Drive to Halong Bay. On arrival, get on on of luxury Halong bay cruises to discover amazing Halong Bay, The highlight of all Vietnam tour packages. Guarantee great experience on amazing Hanoi tour package. Limited numbers available.